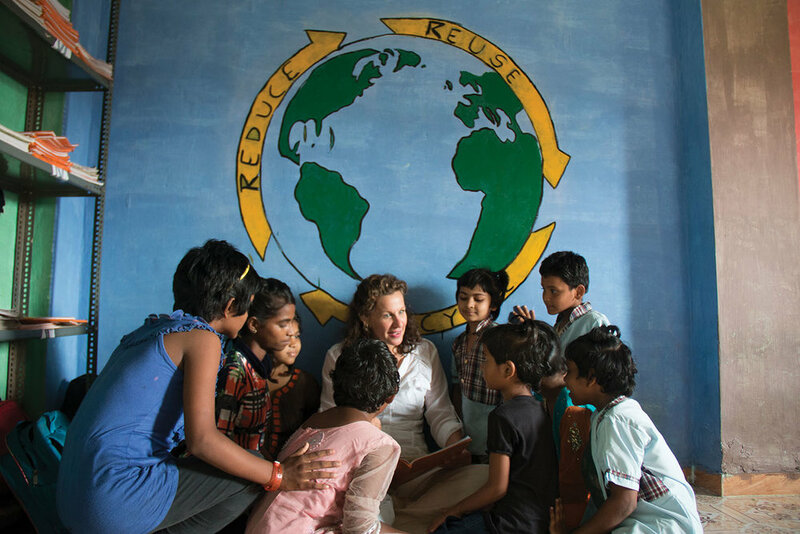 How a summer trek in search of purpose led to an internationally acclaimed foundation straight from the heart of founder Caroline Boudreaux. The first time Caroline Boudreaux traveled to India, she was a 28-year-old account executive at a television station, living the good life in Austin with a high-income job, new car and an active social life. Yet she felt hollow inside. Feeling at a crossroads, Boudreaux took a sabbatical from her job to travel the world with her friend Chris Monheim Poynor. The year was 2000, and the women were “chasing summer” around the globe. One of the many stops on their map was India—not because Boudreaux had pinned the country, but because Poynor had been sponsoring a child there and wanted to visit him. As it turned out the little boy, Manus, was indeed very real and living in the northeastern state of Odisha. The women were given an elaborate ceremonial welcome to his village, where Manus has been receiving Chris’s support and kept all the letters she had sent him. Boudreaux and Poynor would soon discover that Manus was one of the lucky ones. A few days later, they were invited to dinner at the home of a local family. Nothing could have prepared them for what they found when they arrived. Their host, Damodar Sahoo, had been taking in homeless children for several decades. By that night in May 2000—Mother’s Day in the U.S. more than a hundred children were living in the Sahoo complex. The moment that broke Boudreaux was when a little girl toddled over and laid her head on Boudreaux’s knee. She picked up the small child, called Sibani, and rocked her to sleep, then carried her to bed. But what she found in Sibani’s bedroom chilled her. Thirty wooden bunk beds lined the room—and none of them had mattresses, pillows or blankets. The sound that Sibani’s little bones made when Boudreaux laid her down on the hard slats has stayed with her ever since. The realization of just how little these children had—to the extent that safe drinking water and one nutritious meal a day were priorities well above a comfortable bed—hit her like a ton of bricks. On that Mother’s Day 18 years ago, Boudreaux found her purpose in one moment, with a tiny child in a rural village in India. The seed for The Miracle Foundation had been planted, based on one simple but powerful motivation that fueled her: Children shouldn’t have to live that way. “It was simply unacceptable to me,” she says. A few months later, she returned to Austin with renewed energy and began researching and filing paperwork to make her new nonprofit a reality. Donors stepped up immediately to help the vulnerable children that she was building The Miracle Foundation for. “Miraculously, people of all ages, from all walks of life, and from all socioeconomic backgrounds joined us on this journey,” Boudreaux says. That perspective has evolved numerous times throughout her nonprofit’s history. For example, after a few years of working with several orphanages, Boudreaux learned that most of the children living in them were not, in fact, true orphans. They had families who cared about them, but who were too destitute to actually take care of them. From a goal of providing these children with medical care, healthy nutrition, caring housemothers and a quality education; the mission has morphed into one of placing the children back with parents or loving relative homes, where possible, rather than them living in orphanages in the first place—and then equipping these families with the assistance they need to provide. “The goal is to make sure institutions are only there for kids who truly need it; the ones who don’t have parents or relatives that can take care of them,” Boudreaux explains. “But they’re always better off in a safe family who wants them. In spite of the overwhelming support that she received, Boudreaux has faced many challenges along the journey. The biggest of those is doubt: both self-doubt, and the doubt of others. It might be surprising to learn that Boudreaux’s first piece of advice for someone thinking about starting a nonprofit is: Don’t do it. Boudreaux’s newest goal is to work herself out of a job, and The Miracle Foundation out of business, by eliminating the need for orphanages by 2040. So once again, she changed course slightly and began contacting other organizations working on the same goal she had, inviting them to a Global Collective she set up at the London School of Business. This past August, more than 30 organizations and Boudreaux worked for four days at the conference, to develop common strategies and a game plan to place the world’s eight million children living without their own families back into loving homes within 22 years.